Ever since Child’s Play was released in 1988, weirdos everywhere have wished they could get a Good Guys doll just like the one that gets possessed by serial killer Charles Lee Ray in the movie. Now, finally, Mezco Toyz is going to make that creepy dream come true by releasing an officially licensed 15-inch talking Chucky doll that will almost certainly terrorize you and your single mother if it gets possessed by a murderer. If not, though, then you’ll just have a cool thing from a famous movie. 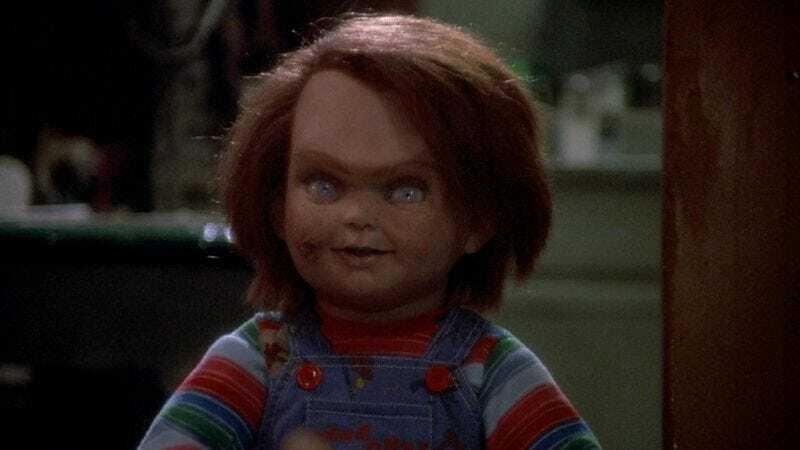 This comes from Horror Society, which reports that the doll will feature “four movie-accurate phrases” and a “head sculpt that perfectly captures” Chucky’s look from the movies. His outfit has also been faithfully recreated, from his cute/horrifying coveralls down to tiny/evil shoes. Unfortunately, it’s up to you to perform the necessary ritual that will allow a serial killer’s spirit to live on in the doll after he’s shot by the police, but taking care of that shouldn’t be an issue for a true Child’s Play fan. The doll can be preordered at Mezco’s official site and will be available before Halloween this year. You can see a preview image of it below.